Hearty soup and extra satisfying. In stockpot, cook bacon over medium high heat, until crisp. Remove bacon to a paper towel line plate. Don't drain bacon fat. Season both sides of chicken pieces with salt, pepper and chicken blend. Add to stockpot, cook until no longer pink. Add onions, potatoes and chicken broth. Stir in celery seed and garlic. Bring to gentle boil, reduce heat and simmer for 30 minutes, until potatoes are tender. The last 15 minutes cooking, stir in cooked bacon and green onions. Garnish with bacon, green onions and cheese. 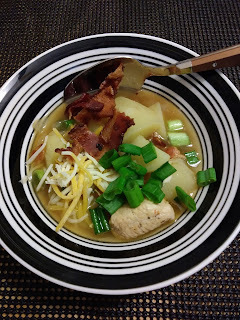 I love this kind of comforting soup and its perfect for this chilly weather! I hope you get a chance to try it soon. I love the chunkiness of this soup and the fact that all the ingredients shine on their own. Bravo!! This looks so flavorful, Christine! I hope you get a chance to try this soon. Thanks! Nothing better than a bowl of potato soup!